LONDON - The word “propaganda” derives its modern use from the name of a 17th-century Roman Catholic institution, the Sacra Congregatio de Propaganda Fide, or Sacred Congregation for the Propagation of the Faith. Established during the Thirty Years War (1618-1648, a sectarian conflict that devastated Europe following the Protestant Reformation), it housed a college that trained priests to advance Church dogma on a divided continent. The role in contemporary quarrels of a term linked to early modern religious strife is disconcerting because it suggests that even secular politics are, in alarming measure, faith-based. 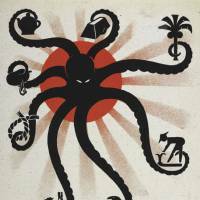 Two exhibitions in London, “Propaganda: Power and Persuasion” (at the British Library from May 17 to Sept. 17) and “The Art of Influence: Asian Propaganda” (at the British Museum from May 30 to Sept. 1) probe this anxiety and, by presenting national styles of persuasion in juxtaposition, reduce antique arguments to examples in the study of a phenomenon. The British Library exhibition is moody and lavish, with video screens murmuring lessons in the history of persuasion, sloping walls set at labyrinthine angles, and ominous, faceless mannequins that suggest man as tabula rasa. The art direction cultivates a slightly paranoid atmosphere that is at odds with the cool-headed understanding of propaganda advanced by the show’s consultant David Welch, who directs the Centre for the Study of Propaganda at the University of Kent, and whose illustrated book, “Propaganda: Power and Persuasion,” accompanies the exhibition. The view of propaganda as rhetoric suits societies with diverse sources of information and porous censorship (“censorship,” Welch observes, “is a negative form of propaganda”—meaning its inverse). But arresting images from revolutionary Russia and China, which were aimed at politicizing illiterate masses, remind viewers that there were times and places in which leaders must have felt like prophets. The innocence of times past is, in any case, relative: Allied propaganda from the two world wars was remarkably crude and married to censorship, and it is to the faith-based deceptions of World War I that Welch attributes propaganda’s bad reputation. 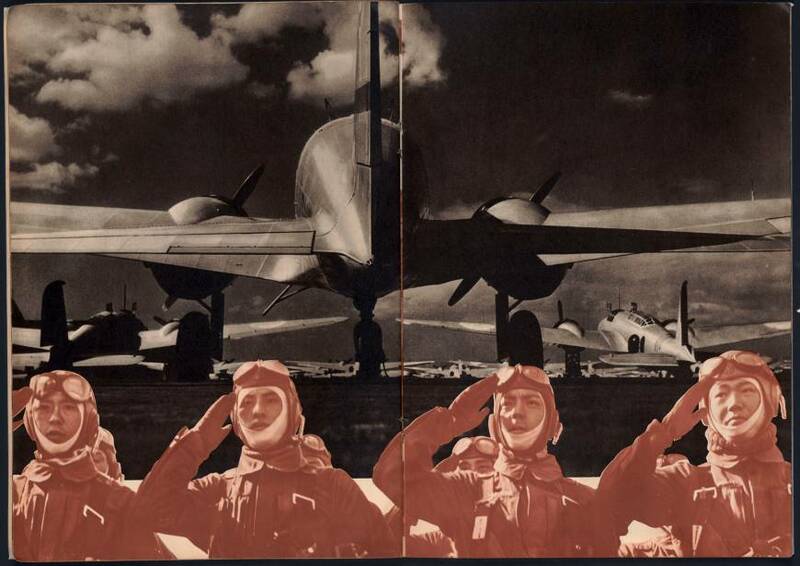 Much of the exhibition’s framing is American, with Uncle Sam appearing on the promotional material, and a 1949 U.S. instructional film, “propaganda techniques” screening at the entrance. Disappointingly, the Middle East — ground zero for so many incompatible narratives — gets light treatment. By contrast, Asia is well covered. 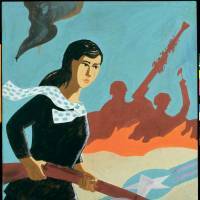 Memorable pieces include a Japanese print from the Sino-Japanese War, which shows Japanese troops attacking Songhwan in Korea while, in a tantalizing modern detail, journalists take notes from behind cover. 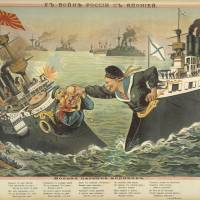 A colorful Russian cartoon, “The Song of the Russian Navy,” misrepresents Russia as the dominant naval force in the Russo-Japanese War of 1904-05. A World War II piece issued by the Indian Independence League, which allied itself to Japan, depicts Winston Churchill holding Indians in chains. A British drawing for Indian consumption shows a tiger trampling German and Japanese flags. 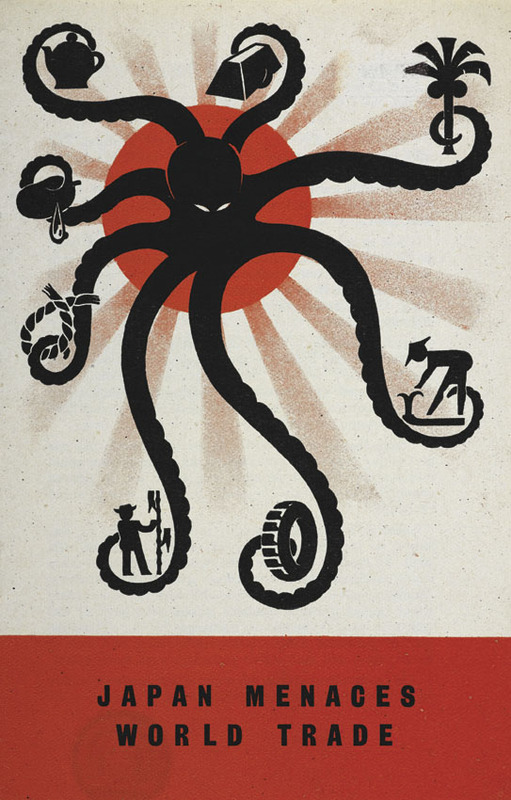 British anti-Japanese leaflets warn that Japan — portrayed as an octopus — threatens world trade. 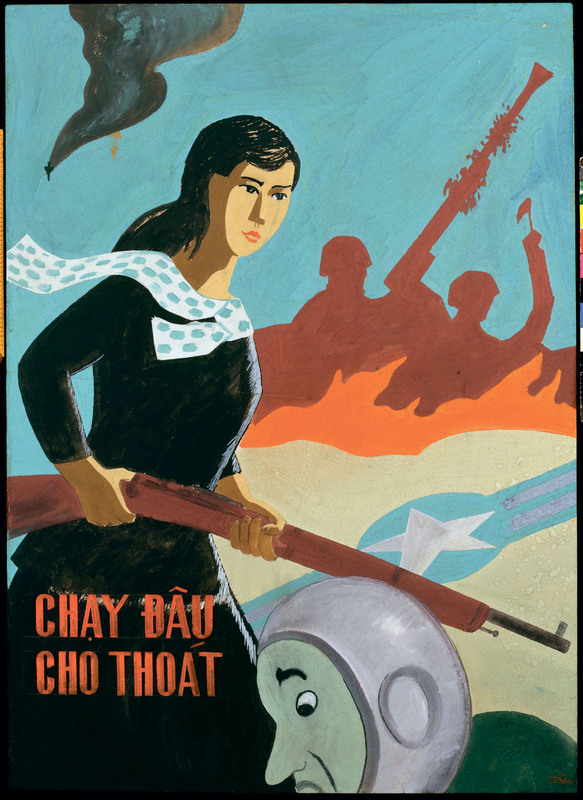 The exhibition confronts arriving viewers with two memorable images: a 1943 Japanese manga caricature of Winston Churchill carrying a bloody lash and drooling as he gnaws a bone, and a 1967 Vietnamese poster showing an armed female communist and a flaming American plane behind the slogan, “Nowhere to Run to Escape.” This juxtaposition suggests both commentary on Britain’s handing-off of global power to America, and an ironic jibe at Obama’s “pivot” from the unhappy Middle East to prosperous Asia. British and American power are major presences throughout the show, which showcases Asian portrayals of anti-colonial struggles as well as the Asia-Pacific, Korean, and Vietnam wars. 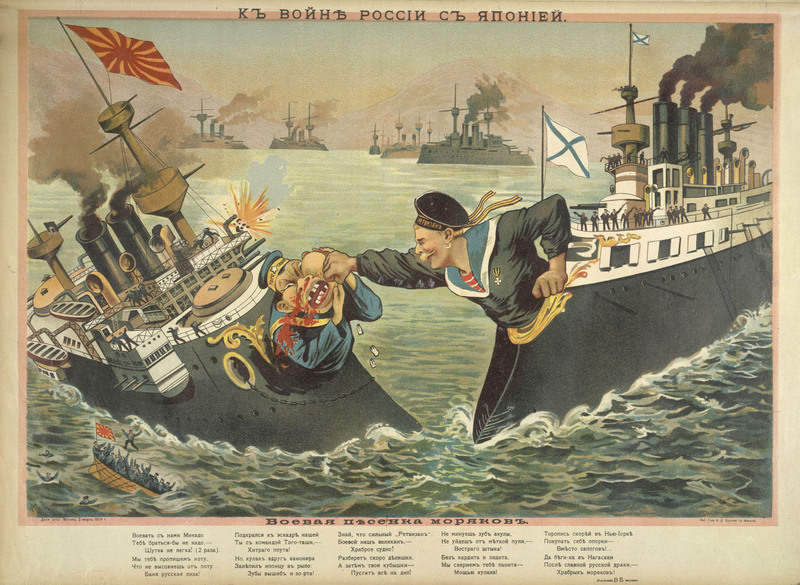 Japan’s rivalry with Russia heralds the era of revolution Ginsberg describes, and it is represented by a Japanese print mocking the Russian navy as “limping fish” following the 1905 Battle of Tsushima. 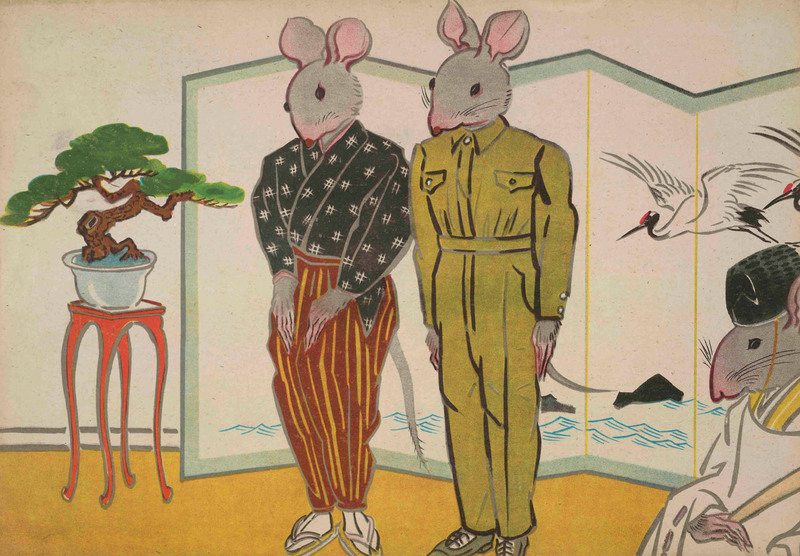 Japan’s defeat of a Great Power unsettled the imperial status quo throughout Asia, but it did not prevent experimentation with Western aesthetics, even through World War II: A 1942 propaganda magazine, FRONT, adopts what Ginsberg identifies as the “photomontage” style of the Russian revolutionary photographer, Alexander Rodchenko, and a 1937 children’s magazine, “Heroic Episodes from the Japanese-Chinese War,” suggests Japanese attraction to American pulp magazines. Many pieces in the show, by contrast, represent radical adaptations of traditional forms. Wartime Japan produced such curiosities as a “Manchukuo kimono” covered in designs celebrating Japanese expansion in Manchuria, and a set of porcelain sake cups commemorating military campaigns. 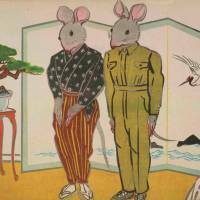 Ginsberg observes that “The Rats’ Wedding,” a 1943 sequence illustrating a children’s folktale, was specially adapted to emphasize the wartime theme of “sartorial restraint” and the groom’s military uniform. His remark doesn’t bring us all the way back to early modern Rome, but it gets us as far as Judea, a province of the Roman Empire whose big ideas would in time reach Rome, and beyond.